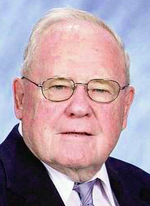 Deacon Eugene R. Leahy, 89, a retired permanent deacon previously assigned to his life-long parish, Holy Family Parish in Philadelphia’s Manayunk section, died Dec. 29. Born in Philadelphia, the son of the late John and Elizabeth Leahy, he graduated from Roman Catholic High School and subsequently saw service in the United States Navy. In his secular occupation he was a butcher with a career at various supermarkets in the area until his retirement in 1984. In 1950 he married the former Rose Cute who died in 1978. Together they raised seven children who lived to adulthood. He entered the diaconate program and was ordained a deacon by Archbishop Anthony Bevilacqua at the Cathedral Basilica of SS. Peter and Paul on June 3, 1990. In addition to a full round of parish duties he was for many years also the chaplain for his Knights of Columbus Council, Immaculata, 3933. He officially retired from his diaconate duties in 2005. Deacon Leahy’s funeral Mass, preceded by a viewing, was celebrated by Bishop John J. McIntyre at Holy Family Church on the morning of Jan. 4. Father Patrick E. Sweeney, the pastor of Holy Family, was a concelebrant and the homilist. The deacon of the Word was Deacon Salvatore Bianco and the deacon assisting at the altar was Deacon Matthew Hrobak. Deacon Leahy is survived by his sons Dennis (Shirley), Gene Jr. (Kathy) and Paul; his daughters, Carol Mongillo (Joseph) and Joanne Jordan (Richard). He is predeceased by his sons John and David. He is also survived by 14 grandchildren and six great-grandchildren. Interment was at Hillside Cemetery, Philadelphia.